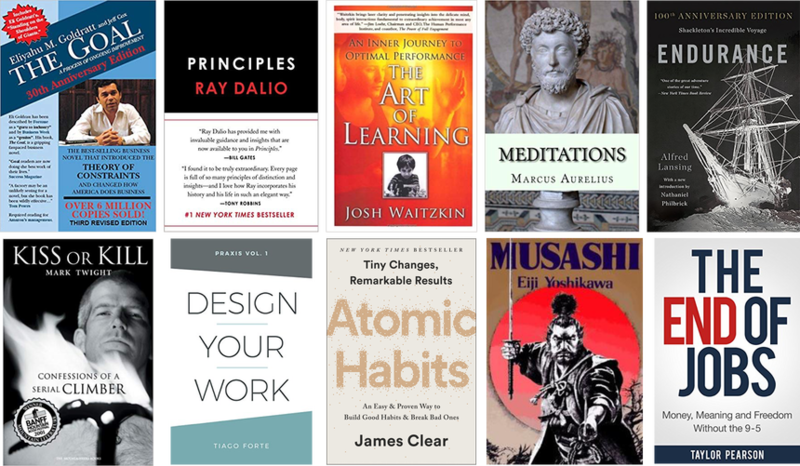 A chance to win 10 exceptional books for peak performance. And all entrants get over $300 of productivity tech for free. (3) We’ll also have some secondary prizes that we’ll add which are cool. Endurance: Shackleton's Incredible Voyage by Alfred Lansing: Think you’ve got problems? How about getting shipwrecked in Antarctica in the pre-radio era, with no one knowing you’re there? An absolutely insane story of a desperate fight to improvise and survive impossibly harsh conditions. Musashi by Eiji Yoshikawa: The personal favorite book of many of the Ultraworking team members, Musashi is a period accurate historical fiction about how a young, restless, angry young man became one of the greatest swordsmen and philosophers in Japanese history. A barn-burner of an adventure story embedded with timeless wisdom. Kiss or Kill: Confessions of a Serial Climber by Mark Twight: The most recent book on our inspiration list, Mark Twight pioneered an aggressive form of hyper-lightweight hyper-speed mountain climbing. He’d often break records of 7+ days to summit a mountain with 36 hours of nonstop lightweight climbing, in incredibly dangerous situations. Mixing timeless wisdom, intensity, and a blend of punk rock and fanatical discipline, there’s a lot to be taken in here. Reading a chapter of this book is roughly equivalent to pounding four energy drinks in a row. The Goal by Eli Goldratt: Maybe the most important book you haven’t read. The Israeli physicist Goldratt turned to studying industrial production in factories with some staggering conclusions — this is the underlying math and logic of the world. Written in novel form, the book clearly teaches concepts from advanced calculus and statistics without the hard math. This book makes you much, much smarter. Principles by Ray Dalio: The most successful hedge fund manager of all-time, Dalio is interested in a lot more than money and investing — this book is about how to deliberately establish principles for one’s life and the people you work with. One of the most fundamental books on how to establish integrity and culture. The Art of Learning by Josh Waitzkin: An accomplished Chess master and champion martial artist, Waitzkin looks for the common threads in how to learn competitive endeavors to world-class skill level. A delightful read that’s worth coming back to again and again — the surface level lessons are pleasant and enjoyable; the deep lessons can be read and re-read, reflected on again and again, to establish faster learning, more excellence, and more joy. Meditations by Marcus Aurelius: For all the technological and social change in the world, it’s amazing how much hasn’t changed. The private journals of the Roman Emperor Marcus Aurelius still offer one of the best starting points for establishing tranquility and calm in the face of intense stress and chaos. A classic that’s been widely loved and enjoyed for almost 2000 years. Atomic Habits by James Clear: Clear’s book on habits became an instant classic for a reason — he rapidly overviews 100 years of research in an easily-read, easily-applied, very enjoyable book. Want to improve your habits? Start here. The End of Jobs by Taylor Pearson: The bad news — the era of safe careers is over. The good news — there’s now more possibilities to live a radically interesting life than any other era in history. Taylor Pearson does an incredible job of rapidly contextualizing the social and technological changes of the last 500 years, and what to do about it now to have an extremely fulfilling and exciting life and career. Design Your Work by Tiago Forte: Tiago's book begins, "I believe work can be a vehicle for personal growth." A genius of experimentation and synthesis, Tiago gives immense amounts of advanced guidance on establishing better work and workflows. Beautifully illustrated with charts and graphs of everything ranging from fulfillment at work, exact breakdowns of type of emails received, task management, reading, decisionmaking… again, Tiago is a genius and his book is absolutely mind-expanding. Going a step further, we’re going to send everyone who enters free access to some of our tech for hitting flow state (Work Cycles), establishing exceptional habits (Lights), and we’ll host a number of free real-time events for people who enter. So yeah, you might win some great books, and you’ll be guaranteed to get some tech to help you in achieving what you want to achieve. Fun, eh? When you enter the contest, you’ll get a chance to win that wonderful collection of books, and you’ll get all the wonderful free tech right away to help you level-up. (3) Writing up the actionable takeaways you got from any of the books on the list (if you’ve read them) or your experience using the free tech we’re sending your way. These are all optional — just put your email in for a chance to win — but we want to make it cool for people who want to go deeper. Entry is open from 16 January, 2019 to 11 February, 2019 — we’ll notify the winner on 12th February, 2019 so they can give us the best address for their book collection. Hyped for some more peak performance? Sign up for free and get additional entries for sharing… and for reflecting on lessons learned. Cool, huh? What books does the grand prize winner get? Just curious… how did you choose the books? We wanted to set the winner up for a year of great reading. It’s a mix of easy and enjoyable reading, and deep and intense reading. It doesn’t quite include all of our most favorite books (Isaac Asimov’s “Foundation” doesn’t quite fit thematically but is a favorite of ours)… but all of these books are exceptional. Musashi and The Goal, in particular, are probably the greatest books ever written in their respective genres. Mostly because it’s cool and awesome, and we like doing cool/awesome things. Maybe you’ll try out The Pentathlon or join The Work Gym — our offerings — or maybe not. That’s cool. We’re on a mission to make work fundamentally better and more enjoyable and happy to help as many people as possible hit peak performance. Also, these books are really, really good. And more reading is certainly a good thing. The contest starts on January 16th, 2019 at 00:01 Eastern Standard Time and ends on February 11th, 2019 at 23:59 Eastern Standard Time. The winner will be drawn randomly and emailed on February 12th, 2019 and will have seven days to reply with a shipping address for your books, so make sure you check your email on February 12th. If the winner doesn’t respond, yikes, they lose out and we’ll re-draw a new winner on February 19th. So check the email you signed up with! Who’s eligible for the contest? Please use a valid email address. Robotic entry shenanigans and similar sneakiness are no bueno and will be invalidated. I want to win! How do I earn entries? Get 1 entry each for: a) Signing up for the contest; b) Sharing on Twitter and; c) Sharing on Facebook. Get 10 entries for: Writing up a 100+ word review of lessons learned from any book on the list or from the free tech you’re going to get access to. In other words, you get a greater chance of winning the grand prize for spreading the word. Your friends will thank you, too — they’ll get a bunch of cool stuff. Email. Check it on February 12th, 2019. Respond ASAP with a shipping address if you won. We’re friendly — contest@ultraworking.com for contest-related things, sebastian@ultraworking.com if you want to drop our CEO a line. We expect a lot of email to the general contest email, so for time-sensitive stuff, email Sebastian. Yeah — we’re really, really excited for this. Excited both for the contest as well as helping you hit some peak performance.